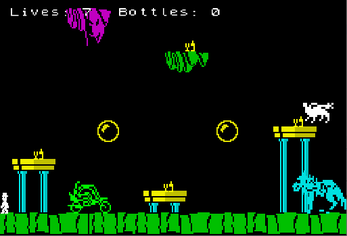 If you only play one Spectrum game today, play this one - which is all of them! Maybe not quite all of them, this is my homage to classic Spectrum games. Explore "Jet-Set-Willy-style" through the maze of Spectrum-themed screens, collecting as many glasses as possible. Not all the exits are obvious, so you might have to look around carefully if you want to find all 24 screens and collect all 69 bottles! Super Spectrum World can now be downloaded! Hello! Nice game, thanks for sharing! Thanks a lot for letting me know about the bug. I've just fixed it and updated the game. Cheers!